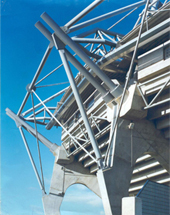 Structural Engineering is a core discipline within Horganlynch since its foundation over 40 years ago. The practice has designed some of the most complex and award winning structural projects constructed in the country and further a field, including the Glucksman Gallery, Croke Park Stadium, The Lyric Theatre Belfast, The London School of Economics Student Centre and many more. The role of structure in architecture is a practice passion and the realisation of architectural ambition by the innovative use of traditional and new construction materials is a significant driver. Horganlynch have gained a reputation for the provision of the highest standard of Structural Engineering Design across a wide variety of project sectors from Public, Commercial, Retail, Education, Healthcare, Sports, Recreation, Conservation and Residential Developments to Industrial , Pharmaceutical and Biomedical projects.